One of the world's rarest cars, a 1971 Plymouth Hemi Barracuda convertible, could fetch over $4 million at auction. Huge, honking, American classic cars have a rabid following. That's in part because of patriotism, America's former dominance of the auto industry and other factors, such as the sheer size of the United States, which has made it easy to drive any size car you like. The wide variety of big, classic American cars also helps foster enthusiasm. You can choose between flashy Cadillacs; old-school, tank-like Packards; elegant Cords and Auburns of the 1930s; vintage Jeeps; swanky sedans of the late '40s and '50s; Corvettes; Thunderbirds; menacing Lincoln Continentals; '50s cars with fins; '60s cars with suicide doors; '70s you-know-what-mobiles; Vipers; Escalades--you name it. Or, like us, you can appreciate all of these cars. But of all the classics, the "pony cars" of the late 1960s and '70s--affordable performance vehicles such as Ford Motor's Mustang and General Motors' Chevrolet Camaro--have perhaps more fans than any others. One of these muscle cars, Plymouth's 1971 Hemi Barracuda convertible, is exceedingly rare and incredibly expensive; it is perhaps the most sought-after muscle car, which would make it a candidate for the most sought-after American car overall. 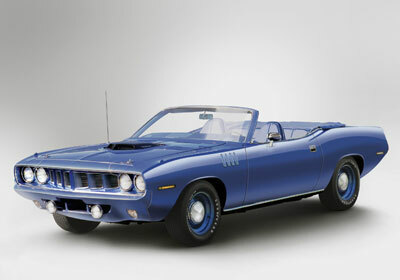 Plymouth only built 11 Hemi 'Cuda convertibles, and Canada's RM Auctions will offer one in January at its annual "Vintage Motor Cars in Arizona" auction in Phoenix. The car's estimated value is over $4 million--not a bad return, considering it sold for $5,000 in 1971. The Barracuda of model years 1970 to 1974 and its near twin, Dodge's Challenger, were answers to the Mustang and Camaro. But the Plymouth and Dodge pony cars came late to the party, could not match the sales of their competitors and were off the market after model year 1974. The Barracuda and Challenger are perhaps the sexiest pony cars, largely because of their stylish front ends with partially hidden headlights. The 1971 Hemi 'Cuda convertible is so desirable because of a combination of looks, rarity and top-of-the-line performance chops. It features a 7.0-liter, 425-horsepower V-8 engine, a distant relative of the early aircraft engines Chrysler built during World War II and a forerunner of today's well-known Hemi power plants. RM's 'Cuda has only 282 miles on it and comes with a complete history and factory documentation. Of the 11 Hemi 'Cuda convertibles, RM's car is one of only three with the desirable four-speed manual transmission. This is the first time the car has been offered for auction. Declining sales and concerns about insurance and warranties for such a powerful performer doomed the Hemi 'Cuda convertible. For model year 1972, Plymouth killed both the 'Cuda convertible and the 'Cuda's Hemi option. 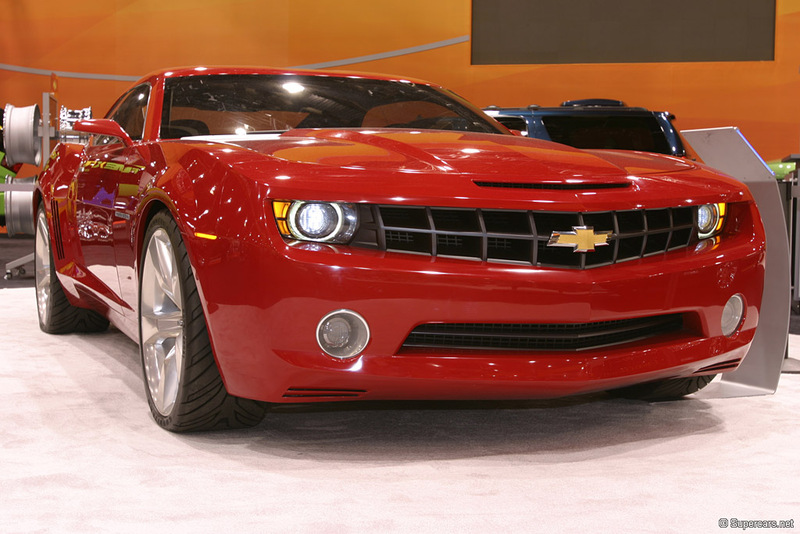 Chevrolet’s marketing gang would love nothing more than to acquire bragging rights to this heroic sports sedan. Too bad, because while GM’s Australian outpost is celebrating the arrival of the new Holden Commodore VE, the bow-tie division near Detroit must cool its heels for a few more years. The Commodore has vast implications for GM globally. It’s the first production car based on the corporation’s rear-drive architecture that has been developed by Holden in Australia and is scheduled to be adopted across the GM board under the Zeta name. Zeta is the platform that will underpin a raft of future Chevrolet, Pontiac, and Buick models, including the recently approved next-generation Camaro coupe and convertible (due in late 2008 or early 2009) and possibly even a rear-wheel-drive Impala by the end of the decade. GM also confirmed that the upcoming Camaro will be built in Canada at the plant that builds the Buick LaCrosse and Pontiac Grand Prix. In Australia, the Commodore VE lineup starts at about $26,500 U.S. for a 241-hp, 3.6-liter V-6 sedan with a four-speed automatic. All Commodores share handsome yet aggressive styling, with bulging front-wheel arches that are more prominent than an M5’s. Mike Simcoe, the former design director for the Holden brand, established the Commodore’s striking proportions early on by stretching the previous-generation Commodore’s wheelbase 5.0 inches to 114.8 and trimming the overhangs. It’s the $34,000 VE SS and $39,500 VE SSV that captured our attention and instantly rendered the Chevrolet Impala SS even more obsolete. Power comes from the Gen IV 6.0-liter V-8 making 362 horsepower and mated to a six-speed automatic or manual transmission. Weight distribution comes in at a balanced 50/50. The platform gets a strut-type front suspension and a multilink rear similar to the setup on the Cadillac CTS and STS. If the Pontiac GTO (based on the previous Commodore architecture) was vaguely raw, the new SS delivers true refinement in a package that is poised, responsive, incredibly stable, and quick. We expect the quarter-mile to fall in about 13.8 seconds and a 0-to-60 sprint to take a tad over five flat. Steering responses are crisp and consistent, light but communicative; the grip from the specially developed 19-inch Bridgestone tires is inspired. The confidence-boosting handling is nearly neutral, and the ride is firm, with enough compliance to soak up irregular Australian blacktop. The cabin is modern, and the seats are supportive. Rebadged as a Chevrolet, the hot Commodore would make one brilliant Impala SS. Driving expectations for the upcoming Camaro just went to the redline. Not even a month has passed since we first reported on Chevrolet’s plans for a super Corvette, a halo model well in excess of the already superb Z06. Judging by these spy shots, it appears assurances we were given earlier this year that the car was on the development fast track (“To Hell and Back,” May 8) were right on target. These photos were taken by George Kachadoorian just outside of Ann Arbor last week. He suspects the car was headed in for EPA testing. While the hood scoop indicates this is something other than an ordinary Z06, the real prize is under the hood where our spies previously heard the whine of what is most likely a supercharged 6.2-liter V8 pushing as much as 650 hp. The engine, which will be hand-built at a rate of 1500-2000 per year at the General Motors Performance Center outside Detroit, features an integrated intake manifold intercooler similar to the one GM developed for the Cadillac STS V-Series. So far, names for the production supercharged Corvette include everything from Z07 to Blue Devil to Corvette SS to Sting Ray. No matter what they call it, look for production of the 2009 model to start in early 2008. And set aside at least $100,000 if you want to one in your driveway. 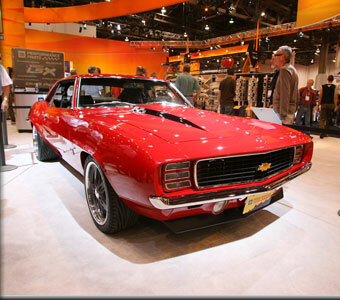 GM sent the red 5th Generation Camaro concept car to Las Vegas, Nevada for the 2006 SEMA show. Why they chose the mock-up model instead of the functional Silver car is beyond me, there is no powertrain, interior or anything functional about the red car. SEMA is one of the premier shows in the world, I would think GM would have rather had the Silver car represent the new model on the floor, maybe it was a scheduling issue that casused the red car to be on display instead, who knows. When GM Performance Parts wanted to find a '69 Camaro to show off its very first LSX crate motor, it wasn't much of a surprise when baseball hall-of-famer Reggie Jackson, an avid muscle car collector, came calling. "He said he was looking for a new project and we just happened to be looking for a car to show off our new motor at SEMA. It was pretty much full steam ahead from there," said Jamie Meyer, product integration manager for GM Performance Parts. The LSX is an all-new cast-iron racing block based on the LS7 engine used in the current Corvette Z06. It's designed with help from drag racing legend Warren Johnson and its goal was to offer weekend racers extreme capabilities at a price around $2,500. "We've tested this block in applications up to 2,500 horsepower so we know it's plenty strong," noted Meyer. Although it's based on GM's small-block design, the LSX offers a displacement range from 364 cubic inches to over 500 cubic inches. In the case of Reggie's Camaro, the LSX displaces 454 cubes, and according to Meyer it develops 640 hp and 611 pound-feet of torque using pump gas and a Holley 850 cfm carburetor. All that power is sent through a heavy-duty T-56 six-speed and 3.91 gears. The original Camaro suspension wasn't going to keep up, so Jackson specified a Detroit Speed and Engineering setup that swaps in coil-overs and tubular A-arms up front and a four-link setup for the narrowed 12-bolt axle in back. Why a narrowed rear axle? It was needed to fit the 12.5-inch-wide rear wheels and the 295/35 Goodyear Eagle F1 tires. Measuring 18 inches in diameter, the Budnik wheels are one-offs designed to mimic those used on the Camaro concept introduced earlier this year. In fact, the car's red paint is the same color used on the concept. As good as it all looks, Reggie likes to own drivers, and this Camaro doesn't disappoint. According to Meyer it will run 10.80s in the quarter-mile, not to mention maintaining high speeds without flinching. "We've had it up to 140 mph at the proving grounds and it was just fine." Try to do that in the concept. Cliffhanger from the forums at GMInsidenews.com is the creator of these very nice renderings of what he would like to see in a 5th generation Pontiac Firebird. 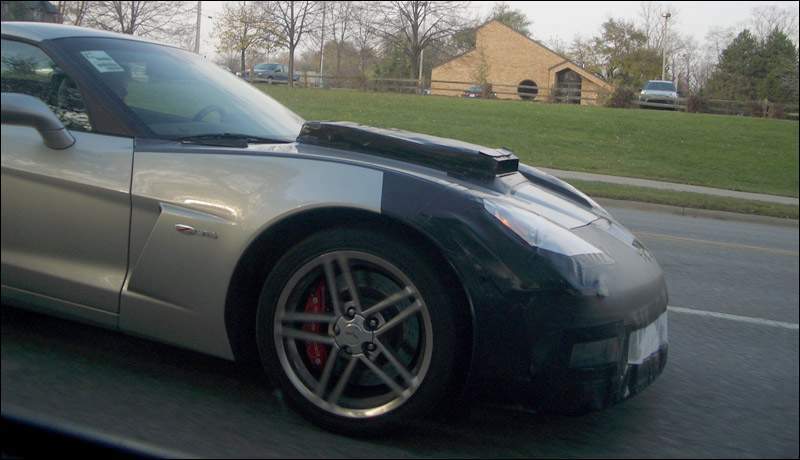 Although GM says they will not bring back the Firebird when the Camaro returns to showroom floors as a 2009 model, may Pontiac loyalists on the internet have created some nice versions of what they would like the car to look like.